Art Traffickr allows Boston-area residents to create meaningful engagements with art during their everyday commute. While a graduate student in comparative media studies at the Massachusetts Institute of Technology, I collaborated with colleagues in the Workshop I course to imagine a technological solution that would enhance the rider experience on the Boston T subway system. Our concept, Art Traffickr, enables subway riders to capture digital objects from the Museum of Fine Art’s collection on their mobile phones. 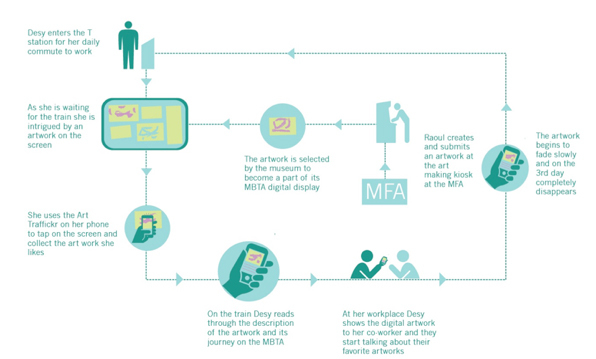 The proposed project consists of three interfaces: public displays of museum collection objects available at each station, a mobile application that allows a user to capture an object from the collection, and a kiosk at the MFA where museum visitors can create digital works that will, in turn, enter into the digital collection distributed at T stations. 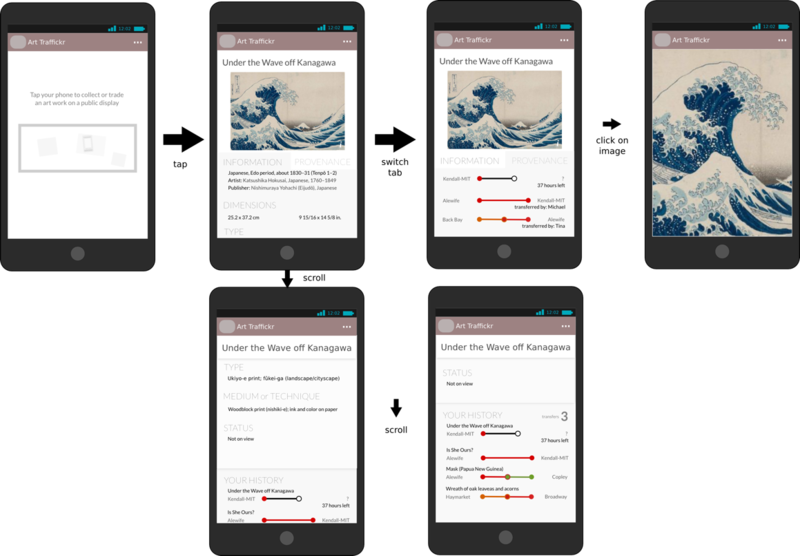 By having users temporarily “own” digital versions on the museum’s collection, we aim to cultivate a sense of ownership, discovery, interconnectedness, and ephemerality. Art Traffickr creates a dialogue between the digital collection of a museum and MBTA riders. An interactive display in each T station invites riders to collect digital objects on their phones, introducing an element of discovery and exploration to the ridership experience. The digital collection mirrors the physical MFA collection: only one version of the digital object exists within the T system. In effect, we’ve created a false scarcity; the digital platform allows us to make endless copies of the digital objects, but the limited number of artworks available is what entices a rider to participate. Thus, when a rider picks up an object on their phone, he or she is the only one that “owns” the object at that time. Additionally, objects can only be picked up at MBTA stations, creating a perk exclusive to MBTA riders. Riders can choose an artwork from the set of objects available in the station at the time, allowing them to discover different artworks each time they ride the T. The works available in a station depend on what artworks other people have left behind, creating a sense of dynamism and interconnectedness among riders. Additionally, each object will track where it has been and which users have previously acquired it. Just as museums keep a record of an artwork’s provenance (who has previously owned the work), so too will the digital MBTA collection track a digital object’s provenance. After a user has “owned” an object for three days, it will fade from the user’s phone, returning back to the MBTA digital collection. This ephemerality ensures that objects will continue circulating among riders. Additionally, the sense of ephemerality also creates a sense of precious time with an object. Just as the limited number of objects serves to entice each rider to collect an artwork, so does an object’s ephemerality make the time with the object all the more special. While the digital collection will initially consist of only works in the MFA’s collection, members of the metropolitan Boston community have the opportunity to contribute to the collection as well. Visitors to the physical museum can create a work of art on an iPad or a digital kiosk during their visit. 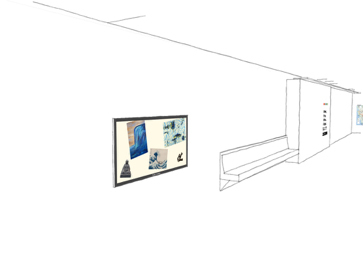 This kiosk can be integrated into an exhibition or learning space as the MFA pleases; for example, the MFA may choose to have visitors respond to a prompt or an artwork on view. After creating their artwork, visitors submit the artwork along with any relevant information (artist name, title, and date). Museum professionals then vet the artworks before they enter into the digital collection. We hope this will incentivize Art Traffickr users to visit the museum in order to submit an artwork as well as create a bridge between the physical space of the museum and the digital collection in the T stations.